Wood-pastures – combinations of grazing lands with scattered trees– are in many regards archetypical cultural landscapes and indicative of their fate. They cover several millions of hectares of European farmland in a variety of expressions, from the cork oak and holm oak dehesas and montados of the Iberian Peninsula to traditional orchards in Central Europe to ancient oak and beech pastures in Southeast Europe. Wood-pastures host extraordinarily high levels of biodiversity and provide manifold ecosystem services. But just as many other cultural landscapes they are extremely vulnerable to environmental and socioeconomic change. Few adequate policies exist to maintain and preserve wood-pastures, as they are in the “grey zone“ between sectorial agricultural, forest, conservation, rural development and other policies. In a recently published volume, my colleague and friend Tibor Hartel and I are tracing – together with 28 contributors (including HERCULES researchers Claudia Bieling and Thanasis Kizos) – the trajectories of different types of wood-pastures in North-Western, Southern and Eastern Europe (see e.g. the photograph from a recent visit to an ancient wood-pasture in Transylvania, Romania). With this edited book, we offer a Pan-European synthesis about the diverse types of wood-pastures, their histories, social and ecological values, governing institutions, threats and conservation approaches. We explore the major drivers of decline, which are related to rapid cultural, institutional and developmental changes. 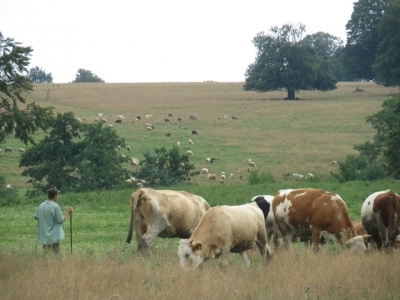 An ironic finding – thoughtfully elaborated by Guy Beaufoy – is that the recent reform of the EU’s Common Agricultural Policy – though termed „greening“ – is proving harmful to European wood-pastures. However, we also find signs for a positive revaluation of wood-pastures through society. In the UK, volunteers have mapped more than 100,000 ancient, veteran and notable trees (usually located in wood-pastures) and thus laid the base for conservation efforts. In Southern Germany, commonly managed wood-pastures have become an asset for local gastronomy, tourism, and regional development. Also, academic interest in wood-pastures has clearly been growing across Europe. From the case studies in our book, it becomes clear that European wood-pastures are changing rapidly and that analysing and managing the nature of these changes is a challenge that requires the integration of a multitude of knowledge. We framed the book around social-ecological concepts and derive some principles of wood-pastures from a resilience perspective. For example, we find that diversity, ecological variability and modularity generate much of the values and the resilience of wood-pastures. Among the key problems of many wood-pastures is the loosening of feedback loops between the social and ecological realms, a loss of social capital and a general lack of innovation, novelty, and experimentation in wood-pasture management. Where does that leave us? The contributions in the book point to a wide diversity of issues that must be considered in order to understand, value and protect the wood-pastures of Europe. For example, they highlight that land-use practices matter; that patterns and processes matter; that time-scales matter; that involving stakeholders matters; that monitoring matters; that knowledge matters; that grazing matters; that biodiversity matters; that institutional transformation matters; that economic profitability matters; and that tourism, protected areas and new institutional structures matter. Given this cloud of issues, a narrow disciplinary research or sectorial policy agenda has limited capacity to provide solutions. Rather, we need a holistic vision of wood-pastures, which is able to generate and integrate information about the ecology, ecosystem services and institutions around wood-pastures as well as their historical interactions.